Habitat for Humanity is a great organization which provides affordable shelter for those of us who can least afford it. It is a noble cause and deserves our enthusiastic support. when humanity puts approaching asteroids to much better use than as themes for action movies. NOTE: Compare Earth orbit with orbit of 1862 Apollo, a typical Near Earth Asteroid (NEA). Earth, other planets, moons of Earth and other planets, Sol itself, and even large asteroids. as well as many types of production facilities. to orbit the Earth at the Earth-Moon Lagrange 5 (L5) point. Perhaps O'Neill's "Island One" might orbit Earth at L5, and his much larger Island Three might orbit Sol at either 60◦ ahead or 60◦ behind Earth in its Solar orbit (Earth-Sol L4 and L5). 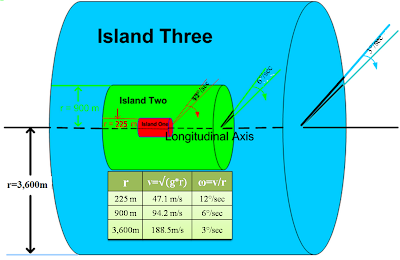 ii.. (pg 59) "Island 1 Rotation Period = 31 sec"
iii.. (pg 93) "Island 2 Diameter = 1,800 meters"
vii. (pg 38) "Island 3 Rotation Period = 120 sec"
The High Frontier: Human Colonies in Space was written in 1976 by Dr. Gerald O'Neill, a brilliant scientist who had previously achieved fame as the inventor of the storage tube for particle accelerators. His book describes a habitat, a large hollow, cylinder which rotates around its longitudinal axis to produce centrifugal force. A carefully selected angular velocity would create centrifugal "g-force" such that occupants inside the outer hull would experience "equivalence", same gravity experience as if static on Earth's surface. Following table adjusts some O'Neill values. Habitats can be "parked" in convenient orbits around large bodies such as the Sun, the Earth, other planets, even moons such as Luna (Earth's moon), Europa (a Jovian moon), Titan (Saturn's largest). Thought Experiment (TE) presumes it's possible to park a habitat adjacent a Near Earth Asteroid (NEA) and fly in close formation. While traveling same orbit as NEA, habitat's human crew could harvest construction materials and volatile ices. If NEA periodically crosses planetary orbits (such as Earth and Mars), it could possibly become a "cycler", a habitat which routinely rendezvouses with certain planets. Habitat Sizes. O'Neill described three habitats: Islands One, Two and Three which differ in size; different sizes give these habitats different deployment capabilities. Length of cylinder does not directly cause angular velocity, the main factor affecting habitat's g-force. However, length does correlate with habitat's mass; thus, to angular momentum. Thus, more length leads to more habitat mass which leads to more force needed to attain required spin for desired centrifugal force to simulate gravity. Shielding to protect payload from radiation hazards. Life sustaining water; many asteroids have hydrated clays or even ice. can prove fatal to unprotected humans throughout the Solar System . ● High energy cosmic rays require constant shielding; they are an ever present health threat in deep space. Over long periods (years to decades), their cumulative effects become deadly. ● Occasional high energy Galactic Cosmic Rays (GCRs) produce deadly radiation. Even worse is secondary radiation emitted by shielding material such as metals and regolith. To best protect against worst case GCRs, habitat designers should store considerable water in the outer hulls. ● Regions of trapped solar wind particles produce very high radiation which dramatically increase during magnetic storms near certain planets. ● Solar Proton Events (SPEs) are bursts of energetic protons accelerated by the Sun. Though infrequent, they produce extremely high radiation levels. Without thick shielding, SPEs can cause acute radiation poisoning and death. ● Coronal mass ejections from the Sun are highly dangerous; they quickly prove fatal to humans unless protected by massive shielding. Since the worst case impacts are so great, prudent risk management calls for radiation shields which "over protect" most of the time. Launching this mass from Earth would be prohibitively expensive, but an asteroid host would have abundant mass for this purpose. is actually a planetoid; thus, it is spherical. .
covered by an icy mantle. olivine mantle, and basaltic crust. Typical Asteroid. Typical asteroid is much smaller than Ceres and irregular in shape. Eons of collisions have reduced most asteroids to collections of dust, pebbles and boulders which fly in close formation throughout their orbit. This loose agglomeration has benefits; it'll be much easier to extract the desired elements. Composition A typical asteroid will likely prove to be a good source of building material. In addition to basic basalt, it contains carbonaceous chondrite, nickel, iron, and many other minerals. Dr. O'Neill discussed co-locating large mirrors with Earth orbiting habitats. These mirrors could direct large quantities of sunlight to the habitats for ample power. Perhaps, very large mirrors can provide Solar power to habitats throughout the Asteroid Belt and beyond. For more possibilities, consider Consolidated Solar Power (CSP) where parabolic mirrors can focus sunlight collected from large areas for much more efficient use of solar power. Many asteroids contain ices: water, methane, ammonia, carbon dioxide and others. If a small, ten meter asteroid were completely enclosed by an transparent, inflatable sphere; then, a few simple resources (1/4 carbon dioxide,1/3 oxygen, 1/3 water vapor) at only 1% Earth atmosphere (i.e., .01 air pressure at sea level) would suffice to grow some kinds of plants. Of course, this type of air differs from Earth air which is 80% Nitrogen. Thus, add Nitrogen for Earth like atmosphere. NEAs are typical asteroids which cross Earth's Solar orbit. While tiny compared to Ceres, a typical NEA has sufficient mass for a human habitat. It is large enough to provide plenty of resources, but small enough to provide an easy landing pad and even easier launch site. NEAs are often considered potential hazards because of the remote possibility they might impact the Earth; INSTEAD, they should be considered as mining opportunities; even better, consider them for future abodes. 1) Earth's oceans will be the most likely source of water for first few habitats. Perhaps water can travel via space elevators to Geo-Synchronous Orbit (GSO). From GSO, process payloads of seawater for eventual use by space bound humans. This method would be slow and expensive, but it's a start. 2) Nearby Comets. For space travel, water from space is much cheaper than water from oceans. A preeminent source of space borne water is the numerous comets throughout the Solar System. As stray comets come to within vicinity of Earth, capture them and use their contents. 3) Collected Comets. Both Earth water and occasional near Earth objects have rigid limitations. Therefore, first interplanetary missions should concentrate on detecting and collecting comets throughout the Solar System. Asteroid Belt Objects (ABOs) will likely have considerable quantities of water and other ices. 4) Kuiper Comets. Eventually, missions to Kuiper Belt will routinely harvest comets. Even further out, missions will harvest bountiful comets from reported billions in the Oort Cloud. Habitats can deploy in the following ways. -----c. perhaps even orbiting Luna. 2. As habitats grow larger, they will disperse, first in Terran orbit around Sol. Such habitats will eventually house millions of humans, possibly at the Sol-Earth Lagrange points. ----L5 would lag Earth by 60° (Maybe name it, Omega (Ω)). 3. Eventually, habitats could orbit moons of the Gas Giants or even establish their own Solar orbits (perhaps to mine asteroids). Some habitats will be "towed" by smaller craft with powerful propulsion systems and then deployed into orbits at other planets. New Economy. As interplanetary vessels prowl the Solar System and collect materials, they will bring them not to Terra Firma (Earth) where they might prove hazardous to the Mother Planet, but to Alpha and Omega to be easily processed. Habitats Alpha and Omega will buy these materials from the interplanetary vessels; thus, detecting and collecting plantesimals will prove to be lucrative. Alpha/Omega will process these materials to add considerable value to them and then sell them to other habitats while these habitats are departing Earth to their destination further out in the Solar System or perhaps another stellar system. Thus, living on Alpha/Omega will also prove lucrative. KEPLER AND HIS LAWS describe orbits in terms of time and position. SPEED DETERMINES POSITION: Determine orbital positions via variable velocities. RETHINKING KEPLER'S LAWS Consider an alternate way to determine orbiting travel times. LINE OF NODES For likely paths of habitats, consider asteroid orbits which intersect the Ecliptic plane near Earth's orbit. Near Earth Asteroid Orbital Elements; A JPL list of Near Earth Asteroids along with their orbital elements. You can sort by period, semi-major axis, perihelion and other helpful criteria. Near Earth Asteroid Close Approaches; A JPL list of Near Earth Fly Bys.You can sort by miss distance, relative velocity and other helpful criteria. Space colonization - Wikipedia, the free encyclopedia; We may have people making habitats on asteroids... I know that humans will ... Colonization of Asteroids would require Space habitats. Astrobiology: The Living Universe - Ethics of terraformation; If an asteroid hits Earth and all life is destroyed, and we didn't bother ... of large space habitats from asteroids which wouldn't harm any planets. NASA's Space Lasso Mission plans to capture a small asteroid and place in orbit around Luna, Earth's moon. some migrating habitats (migrators) will even cruise to the stars.